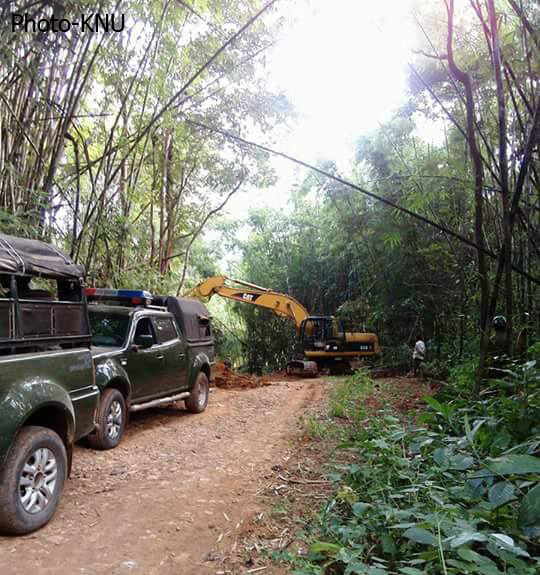 The expansion of the 20-mile-long dry season road connecting Kyaukyi – Mu-The’ village in the Pago (Pegu) region has been ordered to to stop by the Karen National Union because they claim that little consultation with villagers has been done. Local Karen National Union officials at its Nyaunglebin District office said the road building had been stopped after a meeting between Brigadier Saw Eh K’lu Thein, commander of the Karen National Liberation Army’s 3rd Brigade and the Burma Army’s Major General Myat Kyaw, the commander of Southern Military Command, on December 9 at the KNU’s liaison office in Kyaukgyi. Padoh Saw Kler Mu Htoo, the KNU Kyaukgyi liaison officer spoke to Karen News. According to sources from the KNU liaison office, the initial consultation about the road expansion saw 50% of villagers agree and the 50% disagree with the road expansion work. Residents from Khe Der village, a village considered to be the most affected by the plan, rejected the expansion plan. The road expansion started on November 16 and locals became worried that their gardens, located along the roadsides would be bulldozed. A social worker and member of the local civil society organization, Sitaung Thanzin Social Network, said that the road expansion started with the controversial claim that local villagers requested the plan. According to the government’s People Centered Project (PCP), rural roads that are wide enough for a car could be expanded further to 17 feet on each side. The Kyaukkyi- Mu The’ road fit that category and the road expansion was made under the PCP project. KNU’s Kyaukgyi Township officials have sent a letter to the government’s PCP committee pointing out that such activities are against the agreement laid out in the Nationwide Ceasefire Agreement, as the area is classified as a ceasefire area. The KNLA 3rd Brigade Commander, Brigadier Saw Eh K’lu Thein told Karen News that the road under expansion was heavily used in the past as offensive access road. Although the Kyaukkyi- Mu The’ road is considered to be under the KNU controlled area, eyewitnesses told Karen News that the Burma Army cmaps are located all along the road. Karen Soldiers and Gov’t’s Troops Fight In Northern Karen State…Again!